Do not injure, abuse, oppress, enslave, insult, torment, torture, or kill any creature or living being. 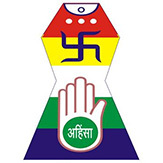 Jainism traditionally known as Jain Dharma is one of the ancient religions of India dating back to almost 3500-3000 BCE. 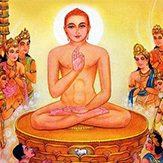 The followers of the sect are commonly known as Jains, a word derived from the Sanskrit word “jina” (victor). It connotes the path of victory in crossing over life’s stream of rebirths through an ethical and spiritual life. The history can be traced through a succession of twenty-four teachers known as “tirthankaras”. 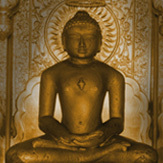 Jains believe that Jainism is an eternal “dharma” with the tirthankaras guiding every cycle of Jain cosmology. 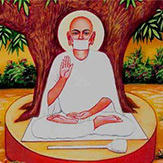 Jain philosophy can be described in various ways, but the most acceptable tradition is to describe it in terms of Tattvas or fundamentals. A tirthankara is a religious teacher who has been freed from the bonds of karma and crossed the world of transmigrations. In Namokar Mahamantra, we bow down in respect to the Panch Parmesthi and worship their virtues. Jain festivals are either related to life events of Tirthankara or they are performed with intention of purification of soul. Compassion to all fellow living beings (along with humans) is central to Jain belief. Tapa (penance or Austerities ) is a great purifier of soul. It can be described as of two kinds, external and internal. Each is of six subdivision. Browse the Jain Samaj Directory according to your city, state or name. Browse the Jain Mandir’s all over the country. 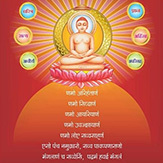 Browse the Jain Dharamshala in your city, state, etc. Lord Ram statue to be built in Ayodhya..
JainDharmOnline is an online portal dedicated to Jainism and it’s followers. We do our best to keep you updated with latest news and events from all the Jain community in India and around the world.